South Australian siblings Germein – Georgia (guitar, keys), Ella (electric cello, bass) & Clara (drums), bring their edgy brand of indie pop rock songs to the SALT Festival, following the release of their addictive single ‘Talking’. Finessed tight harmonies, succinct guitar combinations and a soaring chorus sure to delight with a divine musical experience. 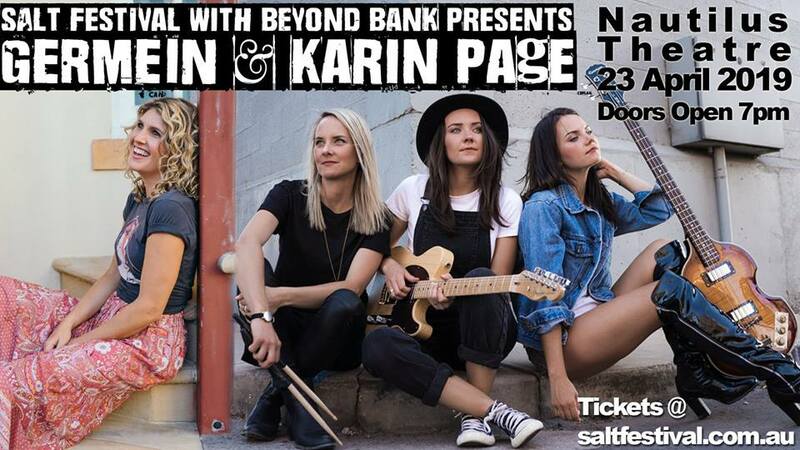 A truly gifted songwriter, Karin Page’s songs appeal to a broad range of music lovers as she seamlessly weaves several styles together. Refreshing and honest, Karin’s music can be intimate and emotional, as well as inspiring you to get up and dance. Proudly supported by Beyond Bank.